Did Microsoft Steal Its New Logo From a Candy Company? Ritter Sport makes fine German chocolate in a variety of flavors. Microsoft makes electronics and software of all sorts. Ritter is found in grocery stores, bodegas, and booze emporiums the world over. Microsoft is found in pockets and PCs and places of business all across the land. Both good companies. Both successful companies. But neither one as much in common with the other...EXCEPT FOR A LOGO. 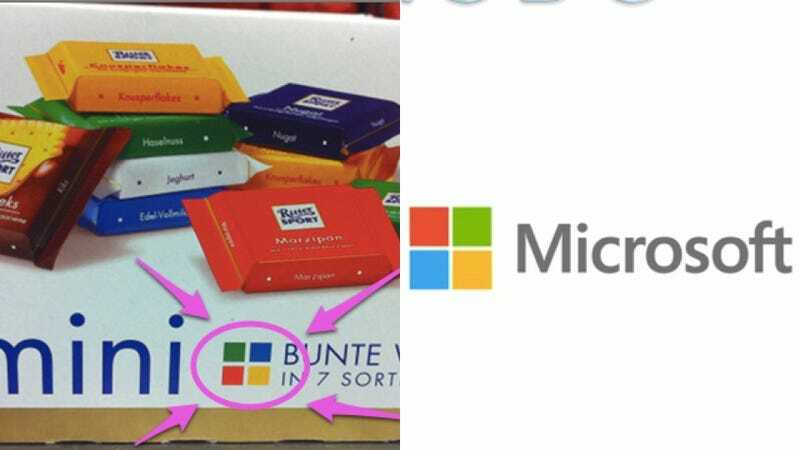 Microsoft's new logo does look suspiciously similar to Ritter Sport's four-color tile grid. Sure, the tile colors are swapped around in three of Microsoft's four quadrants—and the white window-pane lines in RItter's are slightly thicker—but the similarity of this simple yet instantly recognizable design are unmistakable. What Do You Think of Microsoft&apos;s First New Logo in 25 Years? At the time of publication, Ritter Sport could not be reached for comment.